We have handled stinging insect pest control in a safe and effective manner for more than 55 years. There are plenty of standard pest control companies around the Tampa, Florida area and they are great when you have a crawling insect problem, such as ants, spiders, roaches, and so forth. What they often do not get involved with or do not specialize in is pest control related to stinging insects, such as bee removal and the control of wasps, hornets, and yellow jackets. If you are having a problem with these types of pests, your best solution is to call us at Florida Bee Removal. We have been providing stinging insect pest control for more than 55 years. We can perform an initial inspection of your property to determine the location and extent of the problem and provide you with an accurate estimate for the removal or control of the unwelcome pests. Our bee removal pest control services extend to all species, including bumblebees, honeybees, and carpenter bees. We will relocate the bees whenever possible because we understand the importance of bees in food production and the ecosystem that supports all human life. 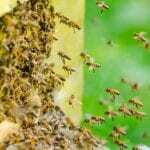 We were the first in the state of Florida to provide bee relocation services when we noticed that the beekeepers that used to provide the service were often too busy in their own endeavors to deal with the growing number of problems in urban areas. We are kept quite busy facilitating between 300 and 400 bee removals each month. If you have questions about stinging insect pest control for your home or business, don’t hesitate to give us a call. We will inspect your problem and provide you with an accurate assessment and resolution to be completed by licensed and insured technicians. Call today for more information.